WAREHOUSING: Ecommerce now makes up over 20 percent of industrial leasing activities. Ecommerce sales increased more than 16 percent in the first quarter of 2018. Ecommerce sales have created strong demand for warehouse space and last-mile deliveries. Demand has driven average warehouse rates up more than five percent in the first quarter of 2018. While ecommerce has revolutionized how consumers purchase products, it has also changed the warehouse and distribution industry. Ecommerce sales increased more than 16 percent in the first quarter of 2018, creating strong demand for warehouse space and particularly for last-mile deliveries. Additionally, ecommerce demand makes up more than 20 percent of industrial leasing activities, compared to five percent just 10 years ago. Because of this demand, average rental rates rose more than five percent in the first quarter. In addition to booming growth within the ecommerce channel, a large share of demand for warehouse space comes from consumer demand for same-day or next day shipping. This is consequently putting retailers, transportation companies, and warehouse and distribution centers under increased pressure to deliver. In this current environment, many retailers are implementing a variety of creative pickup and delivery options, but meeting lofty consumer expectations and delivering consistent, quality service is proving to be a difficult task for some. As well publicized business closings have demonstrated, traditional brick and mortar retailers face significant obstacles meeting these competitive challenges due to the limited capabilities of their existing supply chains. In order to keep up with the current breakneck speed, retailers and others are being forced to come to terms with the limitations of their supply chains and take a fresh look at their logistics management processes. As part of this modernization and evolution, traditional retailers need to expand warehouse space for their growing e-commerce operations and more adeptly meet consumers’ last-mile delivery expectations. However, because of strong demand and tight inventory, particularly in densely populated metropolitan areas, companies face stiffer competition investing in new facilities that allow for quick and affordable access to major markets. This is significant at a time when the market is shifting toward a more regional distribution model allowing retailers to meet delivery demands. Warehousing capacity will only continue to tighten, so growing companies need to stay ahead of the curve in order to safeguard the continual satisfaction of their customers’ expectations. Diverse capabilities. Utilize an integrated solutions provider for seamless storage, fulfillment and distribution. Working with a company offering a range of services increases service reliability and supply chain efficiency. With one provider working across the supply chain, it will allow for easier coordination, increased visibility and more flexibility for pick-up and delivery windows. An asset-based solutions provider should deliver value above and beyond that of a traditional non-asset or asset-light 3PL, both operationally as well as from a cost perspective. An asset-based solutions provider develops the design/solution and also invests capital in trucks, facilities and people; therefore, the asset-based 3PL has a greater level of investment in making the partnership successful. From a pure pricing perspective, most companies have enough buying power to command as good, if not better, pricing by working directly with an asset-based solutions provider. Bundling these services with a single source provider also allows for more competitive rate structures as they typically do not charge management fees on top of the transportation and warehousing rates. Technology. Warehouses should be equipped with EDI as well as software enabling continual visibility for shipments in transit. Companies should also be able to monitor orders and inventory as well as integrate their ERP systems with the warehouse’s existing software. Finally, the facility needs to be able to support future technological advancements and automation. Labor force availability. Companies need to understand labor force demands and labor costs at new warehouse locations to ensure efficiently managed operations for order fulfillment and timely delivery. Companies need to look at whether the warehouse will have the capability of operating 24/7 and whether there are competing businesses nearby that could limit available labor capacity. Safe storage. If a company is seeking warehouse space for products with strict safety and integrity requirements, such as perishable food items or hazardous materials, the warehouse must be fully equipped to handle those products. For example, warehouses should have alarms, secured entry, sprinklers and risk management processes along with the necessary credentials, people and equipment to ensure safe storage and handling. Lease considerations. Companies need to be aware of their specific needs when considering a warehouse’s rental contracts. If a company is distributing seasonal products, a location with flexible storage accommodations is ideal. If a company is considering a long-term contract, the warehouse should provide room to expand to allow for the company’s future growth. Storage requirements. When selecting a warehouse, companies should carefully consider all their storage needs to ensure all requirements are met, including racked or bulk storage, proper square footage and the compatibility of products being stored with one another. Warehouses have differing specialties and capabilities, so it is critical to evaluate which facility is ideally suited to one’s business profile. Location. Location is key to positioning products close to customers for cost-effective and timely delivery. Determining transportation costs to and from the warehouse, including final-mile distances to end customers, will assist companies in choosing the ideal warehouse location. Note that consumers’ expectations regarding time in transit are now often referenced in hours versus days. There’s no doubt retailers are going to need to expand warehouse space and think differently to meet evolving consumer expectations. Selecting the ideal warehousing and distribution center is not without its challenges, but by considering the factors above, companies can ensure they choose the space that best fits their needs and operations. Frank Granieri is Chief Operating Officer of A. Duie Pyle and a member of the company’s Board of Directors. 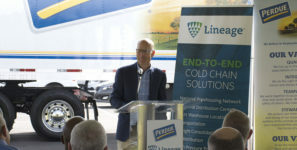 He joined Pyle in 2012, bringing more than 15 years of transportation industry, logistics and executive management experience to his role with the company. Facilitating company activity in marketing, sales, technology and logistics consulting, he is also responsible for A. Duie Pyle’s Custom Dedicated, Warehousing & Distribution and Brokerage business units, which comprehensively serve a wide array of industries.